If you’re looking for the best siding and window installation company in the Denver and Lakewood area, we’re here to convince you that Airtight Exteriors is the obvious choice. Our crew prides itself on providing superior services, and we’ve partnered with the best manufacturers in the industry to provide our clients with superior products. Beyond that, we also offer a litany of benefits that you won’t find from the other guys out there: We hold ourselves to our values and standards, we’re a local company, we’ve earned excellent reviews and testimonials, we have decades of experience serving Denver Metro, we have reliable partners in the industry, we have the right tools for the job, we’re licensed and insured, and we can transform the look of your home all in one fell swoop! Wooh! If that’s reason enough to give us a call, we’d be glad to help you with your upcoming window or siding project. You can also continue reading to learn more about why Denver residents count on us for their siding and window services. We pride ourselves on our excellent customer service, reliability, and experience. When you give us a call for a siding or window installation project, we do our utmost to cater to your needs quickly, providing you with products that will last for years on end, and the workmanship to match. We always work with these values in mind, and we strive to meet your every need. Our home base is in Lakewood, just minutes from downtown Denver. We love working throughout the Denver Metro area, and we cherish the work that our neighbors continually provide for us. Plus, since we’re a local outfit, we can make it to your property quickly, providing a quicker turnaround time for your upcoming window or siding installation. We’re glad to be a part of the community here, and look forward to serving Denver and the surrounding area for decades to come. “Airtight Exteriors was excellent from beginning to end. I had at least three contractors come out to speak with me and I chose Airtight Exteriors because of their knowledge, the trust I had in them, and the price. Mike always had time to work with us on deciding what we wanted and needed, along with any questions we had. The cost was VERY reasonable. Miguel and Olga put in our windows with great care. They really knew what was required for proper installation, insulation, etc. And I have never seen anyone work SO HARD and carefully! They were here on time every day and worked long hours. They remained positive and never minded an interruption when my husband and I had questions. Nothing short of amazing for the whole team!! Best experience I’ve had with a home improvement company! I highly recommend them!” – Deborah S.
We’re so thankful for the glowing review! Please, feel free to read more of our previous clients’ testimonials. We’ve been providing siding and window installations for folks throughout Lakewood and Denver for the past two decades (and counting)! That experience means that we know our way around siding and window installations, making us more efficient, and making our installations more reliable. Our experience, once again, lends itself to our superior service. 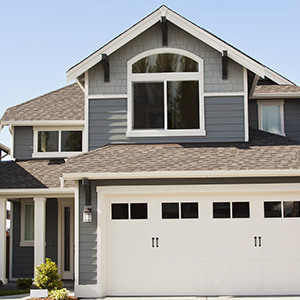 Here at Airtight Exteriors, we’ve partnered with some of the best window and siding manufacturers in the business, so that you can trust we’re using the best products to protect and improve the look of your home. We work with several manufacturers, including James Hardie®, SmartSide®, Mezzo®, Alside®, BuildSmart, Charter Oak, UltraMaxx, and Prodigy. Our partners have been carefully selected by Airtight Exteriors to insure that you are getting the best quality products alongside our outstanding customer service. Since we’ve partnered with these manufacturers, we can also provide warranties that you won’t find from other contractors or if you install your windows and siding yourself. That’s added value for your upcoming project, and that’s a bit of extra peace of mind. Feel free to lean a bit more about our window and siding partners. While you may be tempted to install your siding or windows on your own, we urge you to hire a professional, because it’s likely that you don’t have the right tools to complete the job properly and safely. With Airtight Exteriors, you can trust that we have all the necessary tools to make swift, yet trustworthy work of your project. From ladders to power tools, we have the essentials to finish your job quickly, and we have the know-how to use all of the tools on our proverbial toolbelt. When you look for a contractor, you want someone who is trustworthy and professional. With Airtight Exteriors, you get just that. We pride ourselves on our professionalism, and we know how important it is to gain trust from our clients (after all, we gain business through word of mouth). We’re a completely licensed and insured operation, so you can trust that we’re professionals, and we’re accountable for our work. Plus, if something should happen while we’re working on your property, you won’t have to pay for our mistakes. If you’re working on the exterior of your home, it’s best to renovate the whole facade in one fell swoop. With Airtight Exteriors, it’s possible. We can install your siding and windows side by side, ensuring the envelope of your home is tightly sealed and protected from the elements. Plus, your project will look great as a whole. 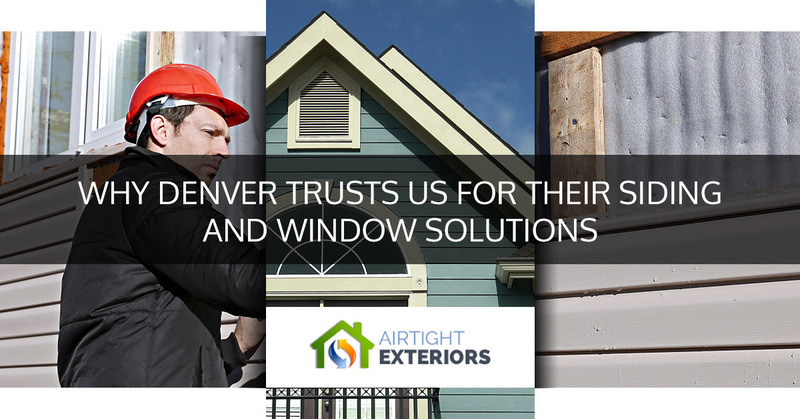 Are you ready to discover why Denver trusts Airtight Exteriors for their window and siding installation needs? Well we’re eager to help. If you’d like to get started, you can get a free quote for your upcoming project, or you can feel free to reach out to us if you have any questions about our services.